We are a main dealer and have all the facilities and level of service you would expect from a main dealer. Our facilities enable us to work on any vehicle. All our MoT examiners are VOSA Nominated Testers who go through a stringent training regime in order to qualify. VOSA Nominated Testers must be skilled mechanics with at least four years experience repairing the vehicle types they test and must achieve a high standard of qualifications in motor craft studies. 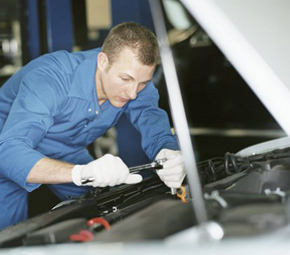 MoT Chorley technicians and MoT Chorley Test Centre examiners - and all other members of staff - are also trained to a high level in customer service and satisfaction. We can guarantee that if any further work needs to be carried out on your vehicle we will contact you to discuss any issues - no nasty shocks. Why Choose Chorley Test Centre for your next MOT? Your time is precious so every part of the MoT process is streamlined at MoT Chorley. We are situated in a convenient location and can even collect and deliver your car, if required. All you have to do is call or book online and let us take care of the rest. A modern facility and our experienced technicians and testers allow us to complete your MoT test speedily without compromising on safety in any way. Your test will be performed in approximately an hour. You save money with Chorley MOT Test Centre before you even start because our MOT Tests are discounted to £30 from the normal rate of £54.98, so we offer the cheapest MOT tests in Chorley, and the surrounding areas of Adlington, Charnock Richard, Coppull, Buckshaw, Croston, Euxton and Eccleston.